I’m a day late–as usual! 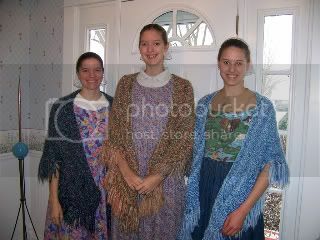 But if you read on my daughters’ blog, Seven Sisters, you will know that we girls were up ALL night! I went to bed at 6 a.m.! Next week, I’ll try to get back on track with Frugal Fridays. So here are the final homemade gifts! 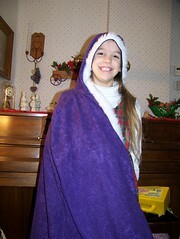 A purple dress-up robe for Bekah! And yes, she DID get a poncho, too! 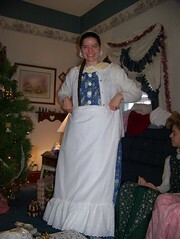 Leah wanted a petticoat–there are 6 yards of eyelet lace on the ruffle!!! Two years ago, I made Charissa a rice bag shaped like a cat, made out of a towel. I got the idea this year to make each of the children their own rice bag (they like to microwave them and take them with them to bed to keep warm!). The rest of them are not so complex–just a tube! Bekah didn’t get one from me–maybe Jessica will post on their blog a picture of the cute cow one she made Bekah! And here are just some cute pictures I couldn’t resist adding in!!! 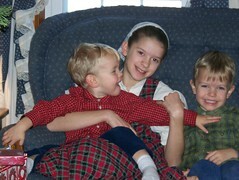 Anna, holding Isaiah, who looks to be trying to tickle Noah! Great picture of Cassia, outside! Brrr! But wait….did you look closer?! Is she…she isn’t! Is she?! We won’t tell you WHY she ran outside to throw something into the dumpster…..nor why in the world she didn’t think she needed to put at least flip-flops on!!!! I hope you don’t get tired of seeing my boys! They are just too cute together! 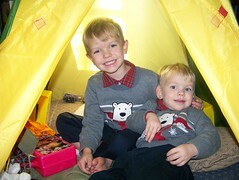 Here they are in their tipi that Daddy found for them! Only one week until Christmas! 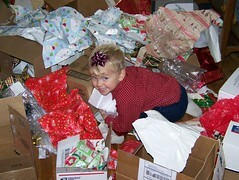 One of my challenges this season is making sure Christ doesn’t get lost even in making gifts!!! And family relationships, too! You know–being sequestered away in your room or sewing room so no one sees what you’re doing? But then they don’t see you, either! Yesterday we were able to all come together and sew as we designated it a sewing day for some friends–so it was okay for us to see what each other was doing! It was a lot of fun, with interesting singing, strange quotes (complete with imitations of the original character who said it with his/her/its accent), growling at our mistakes (louder ones if we made the same mistake again! ), and the later it got, just general silliness! THAT is what makes family memories, whether at a holiday time or not. So I want to be careful to not get so caught up in the doing that I miss the living! Another thing that I want to be careful of is that we don’t get so caught up in celebrating His first coming that we miss preparing for His second coming. I have often pondered how the Israelites weren’t prepared for Jesus’ First Coming, because they were expecting a Conqueror to free them from the tyranny of the Roman Empire. Instead He came in love, as a meek and lowly Lamb of God to be sacrificed for our sin. And now, interestingly enough, as we look forward to His Second Coming, I fear too many are expecting a God of Love and Compassion, when this time He will come as a Conqueror. He certainly IS a God of love and compassion, gently and tenderly leading us along. But if we use that as an excuse to hang on to our sins or act like this world is our final home, being more concerned about the economy than holiness…..well, we are in danger of again misunderstanding and being unprepared for His coming. So I would encourage you, as you celebrate Christ’s birth (although we know He wasn’t really born this time of year), that you don’t lose sight of the most important aspects of this season, and what it meant for "Our great Creator became our Savior", as well as preparing for His coming again–in great power and majesty! May we be found expectantly awaiting our Bridegroom’s return! And now some pictures of more projects we did last year–some for friends, some for our little girls. 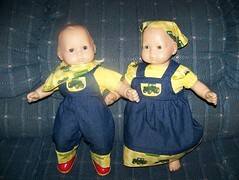 Our friends had two children who were receiving the Bitty Twins (who are the same size as the Bitty Baby), so we made some "John Deere" outfits for them! 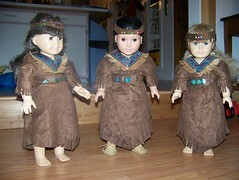 Our little girls all wanted some Native American outfits for their dolls, but seeing the price, I thought for sure I could make them cheaper!!! I made SIX of these for the price of ONE from a well-known company!!! 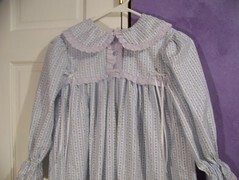 (The other three were also for friends’ children.) 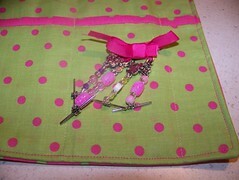 And these had more beads on them!!! This was for a friend’s daughter……. With a matching one for her doll!!! I really love making these homemade things….I just wish I’d get started earlier!!!! Having three November birthdays right at the first of November makes it hard to think about Christmas sewing then. I did have plans to start earlier this year, but circumstances beyond my control put me behind a few weeks (then my lack of motivation/ambition put me behind another week!!! ). But unlike past years, I am not stressing so much about getting it all done. I have decided I will do what I can. That way, I can focus on my family time and celebrating Christ instead of wishing it were all over! I pray you will stay focused on Christ and your family not only during this season, but all through the year. 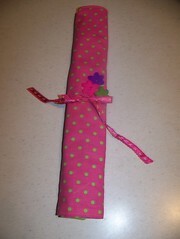 Last year, we made gifts for some friends, and the oldest daughter wanted a knitting needle case. After a bit of searching (was there life before Google?! 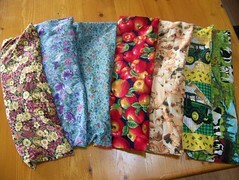 ), I found a free online tutorial for one, complete with pictures! Here are pictures of the case. 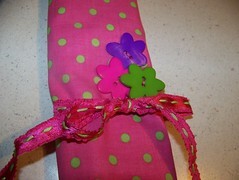 It rolls up and ties shut, and you can be as creative as you want in color schemes and decorative touches!!! I guess my friend’s daughter started filling it up as soon as she opened it! She LOVES this fabric (I got it at Wal-Mart), and I agree it is quite cheery looking!!!! You could do vintage, retro, earth tones, wild, country……the sky is the limit!!! It really didn’t take long to do, and the instructions were very understandable! 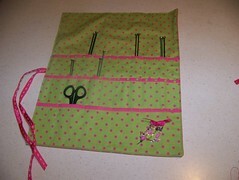 If you want to make one like it, here is the knitting needle case tutorial at Multicrafty. You can click on the pictures to enlarge and see the details better. Are you making some homemade gifts? Or have you for past Christmases? Then sign the linky, and join Vintage Girl’s Homemade Christmas meme! I want to thank everyone who has commented and e-mailed me. Your prayers and thoughts and words of comfort mean a lot! I am doing much better physically (now the challenge is to not do too much too soon!). Emotionally I have my ups and downs! 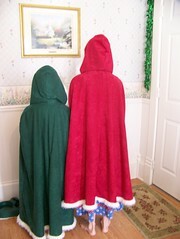 You can visit Miss Emily Rose’s Homemade Christmas archive! 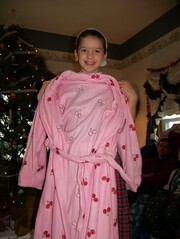 A few years ago, Anna wanted a red dress up robe from Magic Cabin. It was quite beautiful, but when I looked at the price– $35!! !–I thought surely I could make something like it!!! Which is what I did! The "santa fur" trim isn’t usually on sale, but 50% coupons come in quite handy! 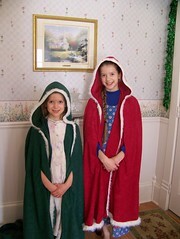 So here are the happy girls modeling their dress-up robes (I used to know how much I spent on each….can’t remember now, but I can assure you it was WAY less than $35 apiece!). 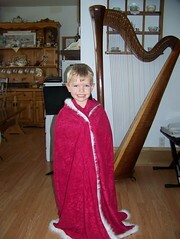 And here’s Noah looking like THE King of the House in one of them! 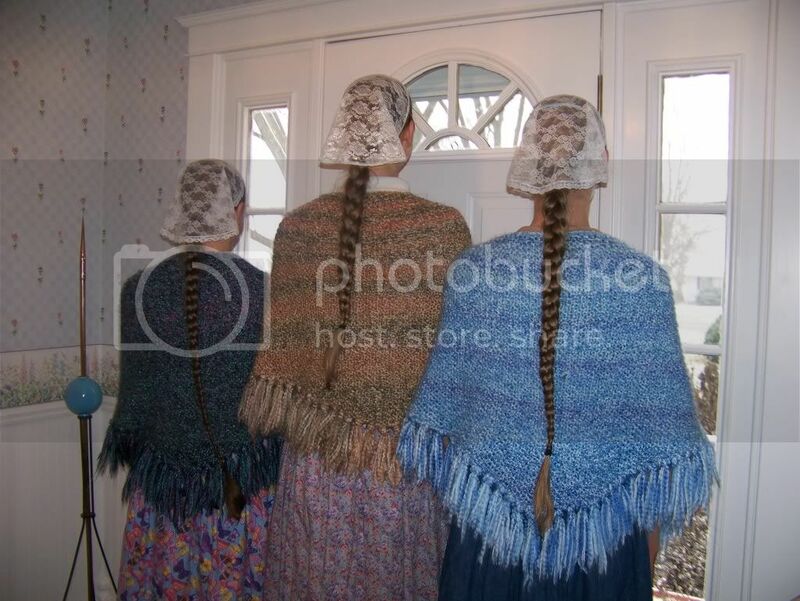 Will Bekah get one to match? I guess we’ll have to wait and see! 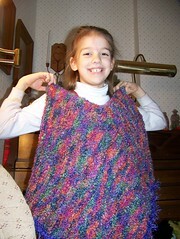 Another gift I made Charissa for her birthday is this cute poncho! 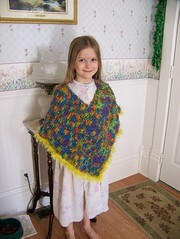 The pattern is Fun Fur Trimmed Poncho from Lion Brand (and it’s FREE!). I had to enlist Susannah (aka Suzanna Mae Janae) to help me crochet the fun fur on the edge. It’s the most I’ve crocheted in my life! (Unless endless chains that I used to crochet as a kid count for something….) A friend made it for her daughter and I thought it was SO cute. It’s an easy pattern, really, and the boucle yarn is quite forgiving of those little mistakes–which I am prone to make–which is why you do NOT see some delicate and intricately patterned lace knit here! Are you doing some homemade gifts this year? Of course you can’t give away your surprise, but maybe you could leave a comment and tell if it’s needlework, sewing, or crafting of some sort? And be sure to visit Miss Emily Rose at her blog–she’s the one who started this wonderful sharing of our ideas! Blessings to you as you make memories for your family! I’ve decided to join Miss Emily Rose on Thursdays with ideas for a Homemade Christmas. We do more and more homemade things each year, and this year might make the all time high! Especially if I can find all those barely-started and half-done projects from years past, as well as materials I had planned to make in years past…..
Of course I can’t show you my planned items for THIS year, at least not yet! Four years ago, when Dallas had his serious accident, I had just started a triangular shawl for myself out of Lion Brand’s Homespun yarn. It is a simple pattern, one you don’t have to think about much, so it was perfect for those 2 weeks at the hospital! I called it my "therapy"! After I finished mine, I decided to start working on one for each of my four oldest girls. 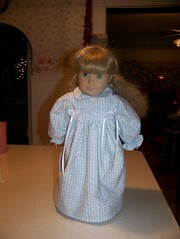 Then I got the bright idea to make one for their dolls, too! (NOT out of the Homespun, though!) It was a great thing for those first few months after Dallas was home (and we had LOTS of visitors! 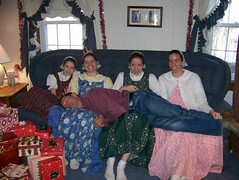 ), especially since I’d just given birth to our 8th child just over a week from when hubby came home! Since Homespun is a chunkier yarn, this will grow quite quickly! 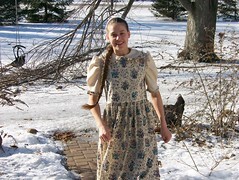 I did add some rows towards the end since my daughters a bit taller than me (one is more than a "bit" taller!). The fringe fuzzes out and makes a nice soft fuzzy fringe! Maybe later I can add the dolls modeling theirs! You can check out more ideas at Simply Vintagegirl . If you like what you see, please vote for her at the Homeschool Blog Awards in the Best Plans, Crafts and Projects category! And be sure to check out her sister’s beautiful print, The Library! Might make a nice Christmas present for someone on your list! And please remember to vote for me in the Best New Homeschool Blog category! Thank you if you already have! Voting ends at midnight, November 21 (that’s tomorrow! ).